The heart works tirelessly for a whole lifetime, pumping fresh blood to the far reaches of the body, supplying oxygen and nutrients. 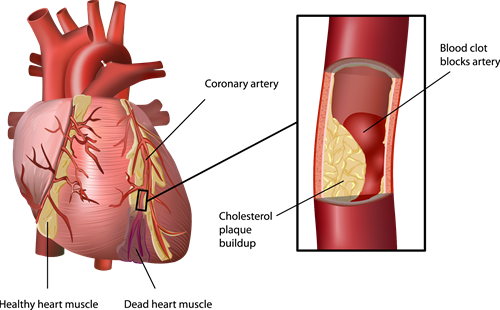 When the heart itself is deprived of blood caused by a blocked artery, the affected tissue withers and scars and can no longer beat (see figure below). According to the World Health Organization, ischemic heart disease is the number one cause of death in men and women worldwide, far surpassing cancers and infectious diseases. Figure: When an artery is blocked by a plaque buildup or blood clot the heart is deprived of oxygen, leading to the death of heart muscle. This tissue will not regenerate on its own. February is heart disease awareness month, a time to take stock of how stem cells are being used to better understand and potentially treat heart disease. The heart is comprised primarily of cardiac muscle cells, called cardiomyocytes, which have very little, if any, inherent regenerative capabilities. Aside from a heart transplant there are currently no treatments which can restore heart function. Many researchers are exploring stem cell therapies as a way to supply the damaged area with functional cardiomyocytes that can replace the scarred tissue with healthy beating tissue. Researchers can take skin cells, for example, from a patient and turn them into induced pluripotent stem cells (iPSCs). iPSCs can then be directed to become any cell in the body, including cardiomyocytes, by exposing them to specific signals or chemicals. As current treatments only manage disease symptoms, restoring function with cell therapy would be a new modality for treating heart disease. Stem cell derived-cardiomyocytes beat in the lab, just like they do in the heart. Getting these cardiomyocytes to mature properly and meet the energy demands that the heart experiences after birth, however, has proven very difficult. Scientists are working to generate cardiomyocytes in the lab that more closely mimic cells in the adult heart. A research group from Columbia University found that by recreating the cardiomyocytes’ natural environment, using stimuli to contract the cells and send them electrical pulses, they were able to coax mature stem cells into a model of adult-like cardiac muscle. Researchers can now use these cells that more closely mimic the cells in our hearts to model disease and test new drugs. In the future, similar techniques may yield cells that can be directly transplanted into patients. A group at the University of Washington recently demonstrated the potential of cardiomyocytes grown from stem cells to replace diseased heart muscle. These cardiomyocytes were injected into the damaged areas of the heart in a primate model of heart disease. After injection, cells were able to attach to the scar tissue, grow in number, and extend a new layer of healthy heart muscle. Importantly, these stem cell-derived cardiomyocytes led to an increase in heart muscle strength, with contractions pumping larger amounts of blood around the body. There is more fine-tuning required, but this research demonstrates a proof-of-principle approach and brings us one step closer to understanding how to repair human hearts. A limitation of the above approach is that when cells are injected into the heart, they leak away with every heartbeat. This therapy is therefore inefficient due to the low retention of cells in the diseased area. To overcome this, researchers and doctors in Paris engineered a gel matrix, or patch, into which they grew the cardiac progenitor cells. They then inserted the gel beneath the top layer of the diseased region of the heart to promote targeted growth of the cardiomyocytes into new muscle. The number of patients treated was too small to conclusively determine whether the treatment was effective, however it is important to note that one year later none of the treated patients had detectable tumors or presented with arrythmia (irregular heartbeats), a current clinical risk. This first trial using the patch demonstrates that cardiac progenitors can be delivered safely with low risk of adverse effects. More research will be required to determine whether this approach will successfully treat heart disease. Significant benefits have not yet been recorded in human trials. Patients should be cautious of clinics offering unproven stem cell interventions targeted at cardiac disease; the treatments have not been proven safe or effective. Scientists are advancing in their ability to make functionally useful cardiomyocytes and demonstrating functional benefits in animal models of heart disease. With continued progress, these pre-clinical advances will be translated into successful treatments that will make strides in the fight against heart disease. For more information see this overview of heart disease and current therapies.